Do you want to tackle stubborn areas of fat with body contouring in NYC? Some common concerns we hear from our patients about their bodies include not being able to reduce their size (regardless of dieting and exercise), sagging skin, and stubborn cellulite. Body sculpting and shaping includes different techniques to help reshape and rejuvenate almost any area of the body. In the past, plastic surgery has been the only answer to these issues. Now, we are able to use non-invasive technology to reduce size in certain body areas, improve tone in lax or redundant skin, and diminish the appearance of cellulite. Body contouring in NYC is an excellent way to tackle persistent pockets of fat, skin laxity, or cellulite caused by genetics, aging, pregnancy and breast-feeding, or significant weight fluctuations. A person may want to address their concerns, but they don’t want the downtime or general anesthesia associated with traditional plastic surgery. The world of body contouring procedures and shaping is a very exciting and ever expanding part of cosmetic dermatology. The dermatologists and clinical team at the Laser & Skin Surgery Center of New York® are focused on working through clinical trials and treatment development of these new technologies, to provide our patients with the best body contouring treatments available. With body contouring in NYC, you can enhance your body shape and improve your self-confidence. CoolSculpting® uses cryolipolysis to lower the temperature of fatty areas and trigger a reaction that reduces fat cells. This non-surgical procedure for body sculpting in NYC is harmless to the surrounding structures, including the overlying skin. With multiple devices, we are often, in appropriate candidates, able to perform dual applications at the same time. The Laser & Skin Surgery Center of New York® is proud to announce we were the first practice in New York City and one of the first centers in the country to offer the new applicator, Cool Advantage™ by CoolSculpting®. Equivalent Efficacy. Half the Time. We are proud to announce we are one of the first centers to offer the brand new FDA cleared applicator Cool Mini™ for the treatment of submental fat (double chin). Thermage® is a radiofrequency device which allows us to achieve significant tissue remodeling by safely stimulating collagen causing contraction. 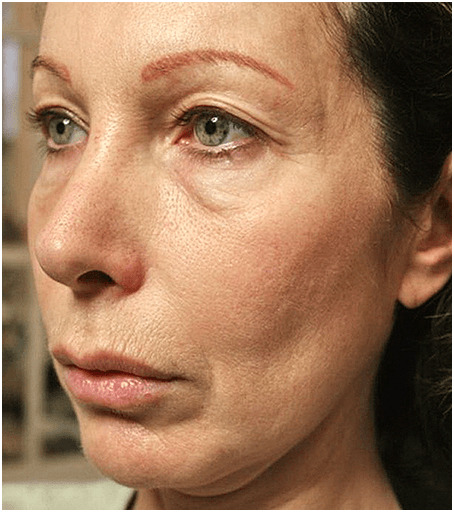 The result is noticeable tightening without surgery or downtime. Cohen SR, Weiss ET, Brightman LA, Geronemus RG, Locke KW, Maytom MC, Dobak JD. “Quantitation of the results of abdominal liposuction.” Aesthet Surg J. 2012 Jul; 32(5):593-600. Brightman L, Geronemus R. “Can Second Treatment Enhance Clinical Results in Cryolipolysis?” Cosmetic Dermatol. 2011 Feb; 24(2): 85-88. Brightman L, Weiss E, Geronemus RG. “Improvement in Arm Skin Laxity and Fat Deposits Using a Novel Bipolar Radiofrequency, Infrared, Vacuum and Mechanical Massage Device.” J Am Acad Dermatol. 2010 Mar; 62(3)(1Suppl): AB148. Anolik R, Chapas AM, Brightman LA, Geronemus RG. “Radiofrequency Devices for Body Shaping: A Review and Study of 12 Patients.” Semin Cutan Med Surg. 2009 Dec; 28(4): 236-43. Brightman L, Weiss E, Chapas AM, Karen J, Hale E, Bernstein L, Geronemus RG. “Improvement in Arm and Post-Partum Abdominal and Flank Subcutaneous Fat Deposits and Skin Laxity Using a Bipolar Radiofrequency, Infrared, Vacuum and Mechanical Massage Device.” Lasers Surg Med. 2009 Dec; 41(10): 791-8.